Low Carb Sausage Breakfast Casserole is loaded with sausage, eggs, and cheese and it is a great gluten-free breakfast for the keto diet. 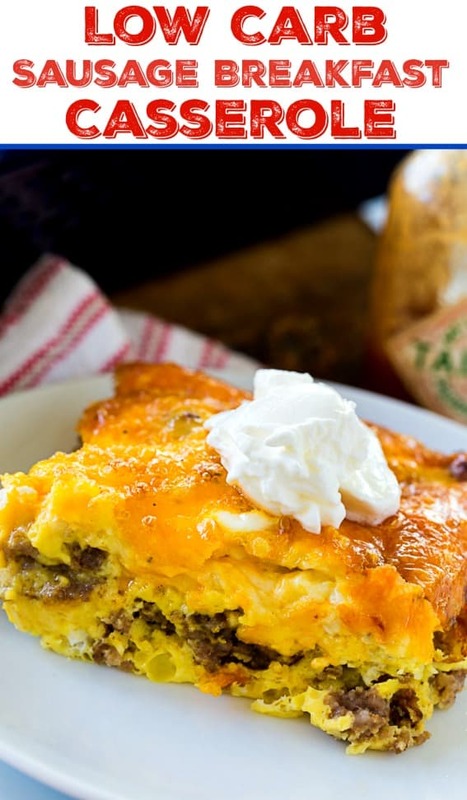 This breakfast casserole is so hearty and filling and full of protein. It’s a wonderful way to start the day! 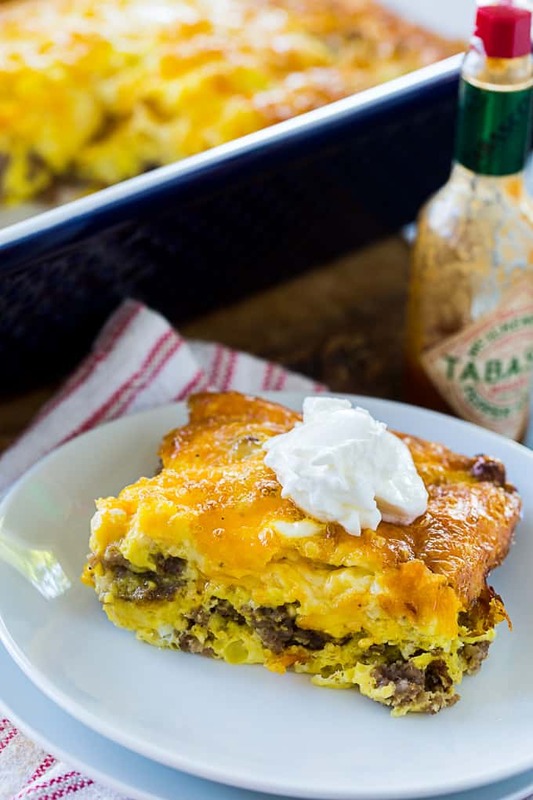 This Low Carb Sausage Breakfast Casserole is a cinch to make and leftovers reheat well. It makes 8 servings and unless you are feeding a crowd, you should have plenty of leftovers. First cook the ground breakfast sausage in a nonstick skillet. Break it apart as it cooks as much as possible. Pour any grease off and add the sausage to a 7×11-inch casserole dish. 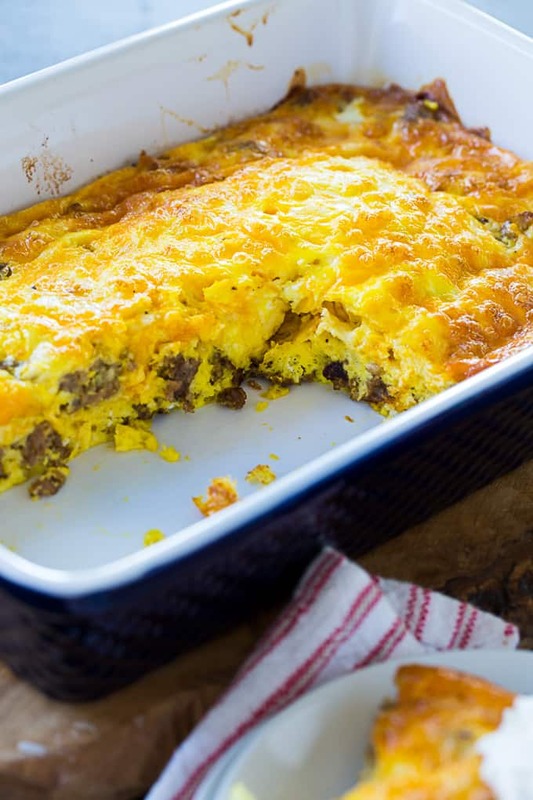 You can use an oval casserole dish but it should be a little smaller than a 9×13-inch pan. Whisk together 10 eggs and 1/2 cup heavy cream. Add salt, pepper, hot sauce, dried minced onion, and the cheese. Pour over the sausage and bake for 30 to 40 minutes. Cut into squares and serve with sour cream if desired. This recipe is very easy to customize. You can use spicy sausage to increase the spice level. Add spinach or change up the cheeses. Only 1 net carb per serving! 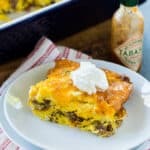 Low Carb Sausage Breakfast Casserole is loaded with sausage, eggs, and cheese and it is a great gluten-free breakfast for the keto diet. Preheat oven to 350 degrees and grease a 7x11-inch casserole dish. 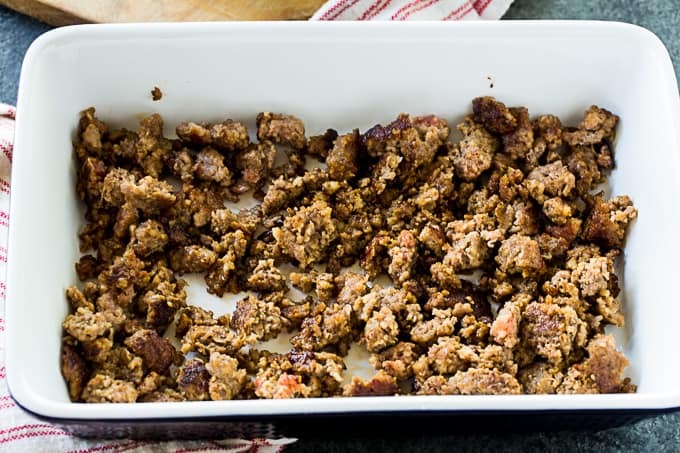 Cook sausage in a nonstick skillet, crumbling it as it cooks. Drain sausage and transfer to casserole dish. Whisk together eggs and cream until smooth. Stir in remaining ingredients and pour over sausage. Bake for 30 to 40 minutes, or until set in the middle. Nutritional info is provided as a guide only and can vary based on products and cooking methods used.